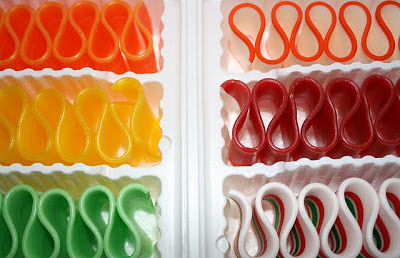 Now that Halloween is over and the holidays will be instantly here -- two seasonal ice rinks are opening in Southern California this weekend -- I got to thinking about ribbon candy. It's an old-fashioned candy, very pretty and a little precious. And it definitely seems like something The Wilfair Hotel might offer guests, if it didn't have a mint dish on the front desk. Ribbon candy also reminds me of how I like to approach writing. If something is mentioned in the "Wilfair" books, be it small, like a cherry, or big, like Fair Finley's inability to make a decision on the Motel Fairwil pool, I'll double and triple and quadruple back and talk about it again, at some point. The process, in my mind, looks very much like a piece of ribbon candy with its multiple folds. And as much as I love licorice and peppermint sticks, I'd never want to write that way, straight and narrow. Story elements need to come back around, as do private jokes and little flirtations, though the characters should further the element or joke or flirtation in a new way with each return visit. Do I also want the "Wilfair" books to be sweet as candy? I do lean that way, yes. Do I also cringe over the notion that I sound a bit puffed-of-chest, talking about writing theories? I do cringe, yes. This blog is for all things related to the books, I must remind myself, and I am rather full of random story thoughts and theories. Uncomfortably full, as if I've enjoyed too much ribbon candy. This seems like the place to put those thoughts. Thanks for your patience with me. Story elements need to come back around, as do private jokes and little flirtations, though the characters should further the element or joke or flirtation in a new way with each return visit. Yes, yes, yes to this! I love my books like this. And TV shows. And movies. Anything really. My life as well! It *is* very much a life thing, isn't it? It reminds me of one of my favorite quotes. I believe Mark Twain said it: "History doesn't repeat itself but it does rhyme." Patterns, coincidences, and common occurrences have a way of showing up, again and again, for all of us.